Henry Juszkiewicz’s tenure as the Gibson boss may soon come to an end as a job ad for a new CEO surfaces online. Gibson, currently in the throes of a corporate restructure, last week sent out a discreet yet momentous dispatch: It is seeking a new Chief Executive Officer. 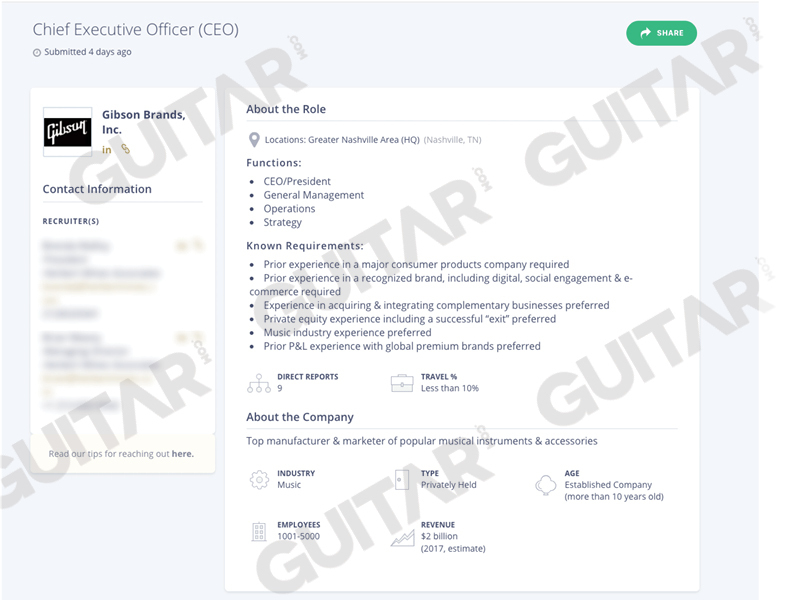 A job advertisement for a fresh face to lead Gibson Brands, Inc surfaced on executive talent portal ExecThread.com about five days ago. Besides suggesting the imminent departure of incumbent CEO Henry Juszkiewicz, the ad includes several intriguing points that raise questions about the future of the guitar titan. And we could witness a drastically different brand emerge from the ashes of bankruptcy. This comes as no surprise. Juszkiewicz has admitted recently that he foresees a new leader stepping in. Bankruptcy documents also confirm that he is currently only on a one-year consultancy contract with the business. However, there will unlikely be any drastic changes to Gibson so soon. Executive talent searches typically take many months to complete, and Gibson’s new owners are likely to be starting the process early to give themselves the best chance of finding a stellar candidate. Going public or selling out? Chief among the ad’s telling details is the preference for candidates who possess “private equity experience including a successful ‘exit.’” When Gibson filed for Chapter 11 in May, private creditors including Silver Point Capital and Melody Capital Partners exchanged debt for equity ownership in the reorganized company. So the word “exit” will raise no eyebrows. Funds, by their nature and business model, seek to obtain a return on their investments. But what impact would this have on the long-term stability of the brand and consumer experience if the former is being geared up for an ‘exit’? And which exit scenario would be best for consumers and musicians? The next chapter will be an unfamiliar one for the brand with over a century of heritage. Gibson has always been a privately owned business, even as its ownership changed hands multiple times in its history. Furthermore, it has not been subject to private equity and venture capital in the way that brands such as Fender, Roland and Blue Microphones (which was recently acquired by Logitech in a $117 million deal) have experienced in recent years. Despite the recent turmoil, this stability has been instrumental in giving Gibson a sense of continuity, at least at the top. If the exit path is through an IPO, it would lower the barriers to capital, augment the brand’s prestige and, of course, provide current investors an avenue to sell their shares. For the new equity holders, this would likely be a fantastic outcome for their investment. 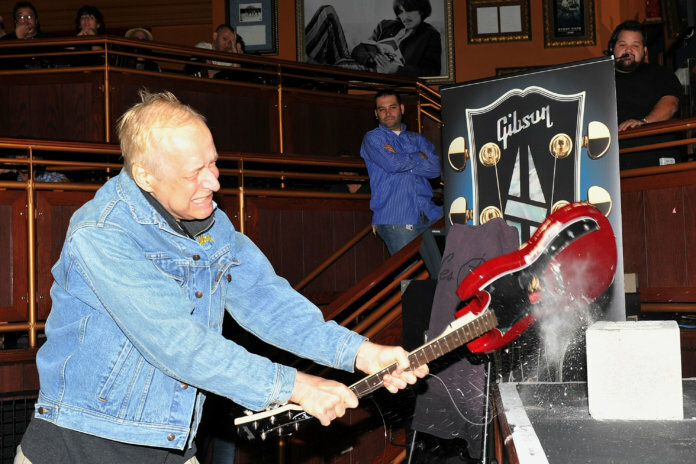 But guitarists should also welcome the potential of an IPO increasing Gibson’s access to capital and talent as well as opening the possibility of owning a piece, no matter how small, of the storied manufacturer. On the other hand, this development may lead to an outcome that is often criticized as a short-term goal for any business: The creditors may purely be looking to clean up the current business and to trade the profitable guitar business to a new owner for a significant return. This could potentially lead to a deeper fracture within the enterprise and raise questions about the long-term vision the incoming CEO would have for the brand. Gibson has already put its flagging consumer electronics business, Gibson Innovations, on the chopping block. Could other non-core brands—KRK and Cerwin Vega among them—follow suit? Gibson famously makes all its “Gibson”-branded instruments in the US, unlike Fender and PRS, for instance. And Juszkiewicz has gone on record saying he believes Gibson guitars should always be crafted in the US. A new owner may herald a change in these strategies, which will likely be a controversial topic for stalwarts of the American brand. This opens up more speculation over Gibson’s thinking around its ongoing businesses. It brings up the question of whether the post-reorganization goal is to consolidate and better integrate the suite of brands that it has already acquired or to seek to acquire more music brands in a continuation of Juszkiewicz’s strategy. Time will tell if this focus will successfully re-establish Gibson as a major portfolio player in the musical instruments industry, or if it will merely better position the brand for the public markets or the selling floor. That said, the most optimistic insight we can glean off the ad is the statement that candidates must be well-versed in “digital, social engagement and e-commerce.” And to understand why, we need only compare Fender’s and Gibson’s marketing and e-commerce strategies. When TPG Growth and Servco Pacific acquired Fender in 2013, they focused on simplifying the business and making the guitar giant friendlier to a contemporary audience. It divested historic acquisitions such as KMC Music and percussion brands Gretsch, Toca and Gibraltar to focus on its core brand. And to that end, Fender launched Fender Play, maintains a robust publicity arm, and more recently began selling its instruments within the US directly via Fender.com. The brand has also been lauded for its video-centric marketing and advertising campaigns that resonate with the next generation of musicians. Gibson’s strategy today feels far removed from Fender’s despite their comparable market share. But, like that famous guitarist whose evolution from acoustic to electric was met with scorn, the times, they are a-changin’. Despite his company’s recent financial struggles and his notoriety in the industry, Juszkiewicz has proven himself an able captain. In the ’80s, Gibson had shuttered all of its divisions save for one line of guitars—and it still lost money. Then Juszkiewicz and his business partner David Berryman bought the company in 1986 and, within a few years, turned fortunes around. 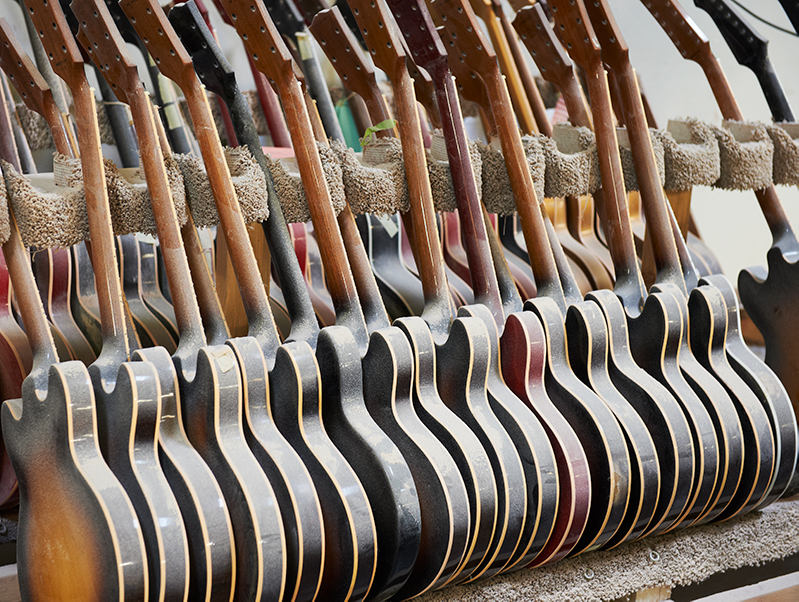 Although subsequent investments have created a challenging environment for the group as a whole, the core guitar business reportedly continues to contribute significant profitability to the enterprise. Whatever the circumstances of his own ‘exit,’ Juszkiewicz’s reign deserves to be remembered for growing Gibson into one of the world’s most successful musical instrument businesses.